Bolduc in french means 'gift ribbon' and the one H uses to tie up the orange boxes is dark chocolate colored and has raised off-white stitching and logo. 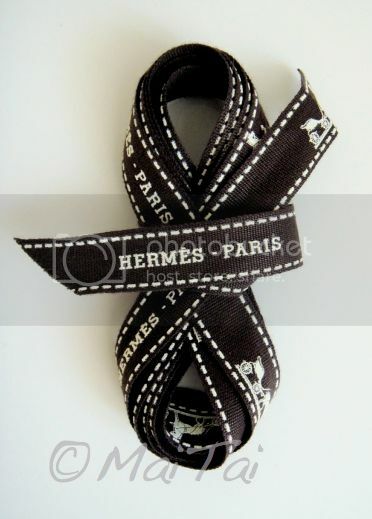 Inspired by this ribbon, the the Bolduc au Carré (Ribbon in a square) 90 Carré was introduced in 2007. Designed by Cathy Latham, it shows multicolored strands of Bolduc woven into each other. It has since been reissued in many sizes and materials, on of them being the Twilly below. Ah, so lovely! The twilly was something I really did not 'get' at first, as always with H, the magic starts and then you get smitten! This is the scarf that started it all for me (I have a 90 in the blue cw) Boring outfit that needed some attention--and there was the H shop with all it's beautiful things right in front of me. Made the dress so much the more interesting...and started me on a fun journey. Thank you for the information --I like knowing little interesting facts! 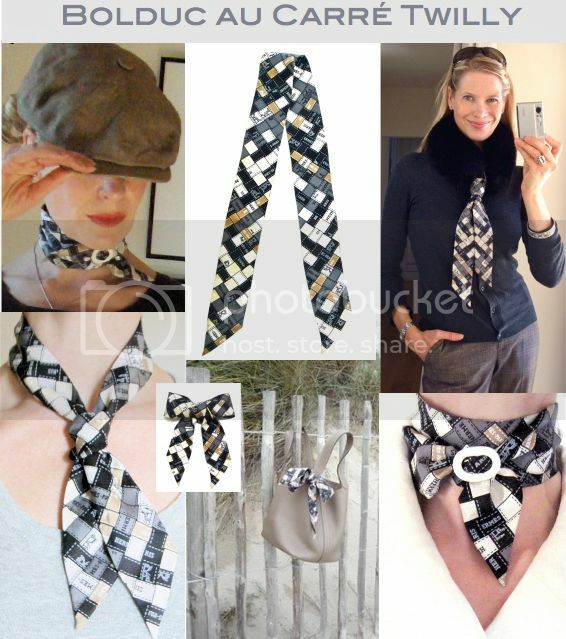 MT.. thanks for another great profile, the bolduc au carre twilly looks great on you, love it with the gavroche ring. (just my opinion!) but I think this is the best CW for this design. Yay to you DD! Love that shot too, it carries happy memories. Just writing to say that I do enjoy your blog. I have been checking around and I miss a section with your tips about how to take care of the H scarfs: washing, folding, storing, rain and sun exposure etc. I hope that in a future you will share that with us since you must be an expert having so many many H scarf. Do you happen to still remember or keep record of the item number and colourway number of this twilly? We want to get this one but it's not a current edition one so we can't tell.... Thanks! Thanks very much for the item code! I will check with Hermes and see if they can find any remaining twillies. Thanks!